The factory of the future, the world's fastest e-vehicle charger and ABB Ability™ digital solutions are at the heart of the ABB exhibit showcasing the increasingly smart technologies transforming the future of industry, energy, mobility, cities and work. ABB’s leadership in digital industries is being showcased at Hannover Messe 2019, with displays of collaborative automation and digitalization technologies that are driving the next phase of the Fourth Industrial and Energy Revolution. This year’s event also presents the new ABB, which is intensifying its emphasis on customers by simplifying its organizational structure as of April 1, 2019 to focus on four entrepreneurial businesses: Electrification, Industrial Automation, Motion, Robotics and Discrete Automation. As the pioneering technology leader in digital industries, ABB's deep domain expertise and the innovative ABB Ability™ offering of digital solutions and services are enabling customers to achieve new levels of flexibility, efficiency and performance. ABB's world-class research and development in autonomous systems and industrial artificial intelligence will drive the digital transformation into the future. A factory of the future installed at the ABB booth demonstrates how ABB is making "mass customization" a reality today. The model production line assembles wristwatches in a lot size of one, in real time, while attendees watch. Such flexibility is important because, to thrive and grow, manufacturers must have the agility to launch new products more quickly, and the flexibility to cost-effectively tailor production runs with greater variety in smaller batches. 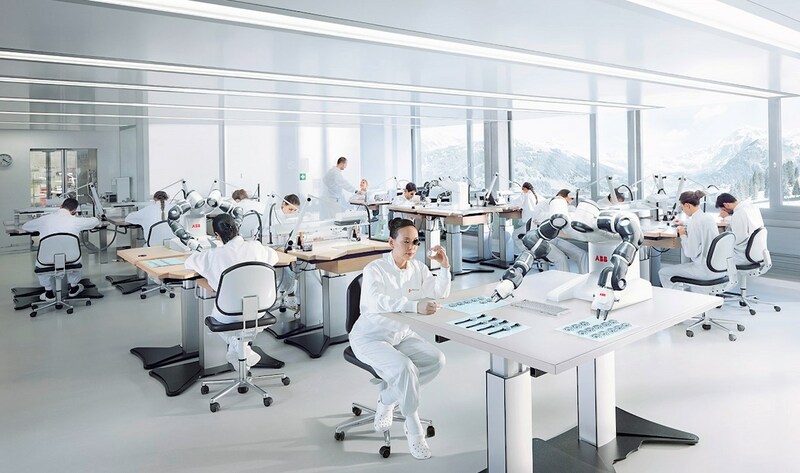 ABB's flexible, efficient digital manufacturing ecosystem makes it all possible: YuMi® collaborative robots perform precision assembly operations; the SuperTrak flexible transport system orchestrates the timely movement of parts from station to station; and ABB Ability™ Connected Services monitor health and performance, sending data to the cloud so advanced analytics can be applied to unlock the highest levels of productivity, ensure proactive maintenance, and speed issue response and recovery time by as much as 60 percent. The ABB Ability™ digital offering is the cornerstone of the factory of the future and a rich selection of more than 210 ABB Ability™ solutions and services currently available in the new ABB are highlighted at the fair. ABB Ability™ solutions leverage the power of sensors, network connectivity and data analytics to provide real-time views into operations, enabling predictive maintenance, improved safety and reduced operational (OPEX) costs. Going forward, ABB Ability™ is building upon autonomous technologies and industrial artificial intelligence as ABB writes the future of digital industrial systems that will be able to adapt and even learn in complex, data-rich environments. Digital Twin technology is delivering some of the biggest wins today in helping customers embrace the future while avoiding potentially costly glitches and inefficiencies. Digital twins use virtual representations to model factories and production lines on computers before they're constructed and brought online. To deliver maximum customer benefit, such pre-production modeling must be robust and available in 3D. That's why ABB and Dassault Systèmes in February announced a landmark partnership that will drive enhanced digital transformation across intelligent industry through the combined power of ABB Ability™ and Dassault Systèmes' advanced, collaborative 3DEXPERIENCE® platform. The partnership with Dassault Systèmes completes the list of successful strategic partnerships ABB already fosters in the digital area with IBM, HPE and Microsoft. Sweden is the partner country for this year’s Hannover Messe, which will allow ABB to showcase several partnerships from the country perspective at the Sweden pavilion in hall 27. ABB is featured in the factory of the future with Ericsson, Tetra Pak, as well as energy efficiency with Stora Enso. Smart motion, which saves energy and drives efficiency and productivity across the entire value chain, is also a critical component of the intelligently automated factory of the future. Here, ABB offers a rich portfolio of smart, digital solutions for the complete machine lifecycle. ABB Ability ™ Condition Monitoring for powertrains provides full visibility into operational parameters, ensuring equipment is available, reliable and maintainable. ABB Ability™ Smart Sensor leverages the Industrial Internet of Things to monitor key parameters of motors, pumps and mounted bearings in real time. In e-mobility, ABB is the global leader in DC fast charging, with more than 10,500 ABB DC fast charging stations sold in 73 countries. ABB's cutting-edge fast-charging technology is on display, led by the Terra High Power charger, which adds 200 km of range to an electric car in just eight minutes. ABB's chargers have been selected by Electrify America for use along highways as part of the biggest EV infrastructure project ever in the United States. ABB is also bringing convenient fast-charging infrastructure directly to EV users with the new 24kW DC wallbox. This compact DC fast charger, which uses ABB Ability™ Connected Services to integrate with payment platforms, is ideal for installation at offices, dealerships and public parking places. On a broad scale, ABB is helping the world achieve sustainable mobility with smart charging solutions throughout the transportation ecosystem, from electric cars, trucks and buses to ships, trains, cable cars and water taxis. And ABB is taking e-mobility into the future as title partner of the ABB FIA Formula E Championship, the world’s first fully electric international FIA motorsport series. ABB Formula E driving simulators are on display at the ABB booth. In the smart city of the future, fast chargers will be but one element of a comprehensive offering of infrastructure of smart solutions that encompasses utilities, buildings, transportation, water, communications and public safety. ABB solutions are at the heart of this smart-city future, with digital leadership in automation and efficient energy management of the buildings and factories we work in and the homes we live in. In energy, ABB is writing the future of smarter power distribution and intelligent electrification, making distribution of electricity safer and more efficient, reducing environmental impacts and lowering costs. ABB Ability™ Energy Management for Sites is cutting energy costs and emissions by monitoring power available from all sources, including renewables like wind and solar, and then optimizing usage at the end point. ABB is showcasing the future of industry, energy, mobility, cities and work at hall 11, booth A35 at Hannover Messe 2019.